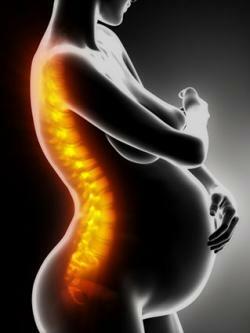 Back pain is a common symptom during pregnancy. It can worsen during the third trimester as the advancing pregnancy puts increasing strain and stress on your back. Some simple remedies can help ease your pain. Consult your doctor if you have any concerns about it. Softening and laxity of ligaments and joints: The hormone relaxin causes softening of ligaments in the pelvic bones and lower spine in preparation for delivery. The resulting loosening of joints in these areas is said to contribute to low back and pelvic girdle pain. Stretched out abdominal muscles: As the enlarged uterus and baby stretch and weaken the abdominal muscles, there is less support for your back. Pre-existing back problems: If you have any pre-pregnancy back problems, such as arthritis or a herniated disc, especially in the lumbar spine, your pain may worsen as your pregnancy progresses in the third trimester. Urinary tract infection: Urinary tract infections (UTIs) are more common in pregnancy, and when they affect the kidneys, they can cause mid back pain. Burning with urination and fever may also be present. UTIs can also trigger premature labor. Labor pain: It is important to distinguish labor back pain from other causes of lower back pain. Unlike non-labor pain, labor pain may come and go and vary in intensity over a short period. Abdominal pain or menstrual-like cramps may accompany the low back pain. Other signs or symptoms can be present, such as vaginal bleeding or leaking of fluid from your water breaking. The most common location of back pain during the third trimester in pregnancy is in the lumbar and sacral areas of the lower back and can range from mild to severe. However, pain can also occur in the upper back and neck. Your lower back does the lion's share of supporting your weight gain, baby, and enlarged uterus. According to an article in Current Reviews in Musculoskeletal Medicine, 50-80% of pregnant women have low back pain during pregnancy. This is more common after the fifth to seventh month of pregnancy, according to a study published in the journal Spine. As you gain weight and your belly gets bigger, you shift your posture to compensate. This causes your lower or lumbar curve to shift forward, which puts more strain on your spine. You might have pain in the middle of your lower back, or the pain may be worse on one side or the other. The pain may extend to your buttocks and down the back of your thigh to your foot if the sciatic nerve is affected (sciatica) at your lumbar spine or sacroiliac areas. Your sacroiliac joints, sacral vertebrae, and pelvic joints below the level of your lumbar spine may be loosened by your pregnancy hormones. In this case, according to a review by the University of Western Sydney, your lower back pain may be accompanied by sacral and pelvic girdle pain. Deep pain in the coccyx or tailbone (coccydynia) is usually caused by relaxation of the ligaments and joints in the coccyx. You may feel pain on both sides of your tailbone and down your buttocks and upper thighs. The pain may worsen after sitting, standing, or walking for a while, or as you get closer to term and your baby descends to the level of your tailbone. Upper back and neck pain is less common than lower back pain during pregnancy and gets just a passing mention in clinical studies. Pain in the upper back and neck vertebrae and muscles in the third trimester can be partly explained by the shift in posture and the realignment of the spine. Stress, muscle tension, and inadequate rest can also lead to muscle tightness and spasm in the neck, shoulders, and upper back muscles, especially after working all day. In addition, increasingly in the third trimester, heavier breasts might put a strain on the upper back, shoulders, and neck muscles and increase the intensity of pain. Cold and heat: Apply cold packs to areas of pain for the first two to three days, and then apply heat in the following days. Avoid applying heat or cold to your belly. Adequate back support: Sleep on your side with a pillow between your knees. Try to avoid sleeping on your back. Use a pregnancy pillow to support your back, belly, and legs during rest or sleep, and use a good back support when you sit. Pregnancy support garment: Pregnancy support garments support your belly and can ease the strain on your back. This should include a good support bra. Back massage: A massage during pregnancy can help you relax and ease your discomforts. Ask your partner or a friend to massage areas of pain in your back or get a massage at a spa. Exercise: Strengthening and stretching exercises, such as yoga, can help relieve the extra stress on your back. Doing exercises in water can take the pressure on your back. Talk to your doctor about which exercises are safe for you during the third trimester. Supportive Shoes: Wear low-heeled shoes with good arch support to help keep your spine aligned and supported. Shoe inserts and supports can also help do the same. Avoid flat or high-heeled shoes. Alternative treatments: Ask you doctor for advice about chiropractic adjustments and acupuncture treatments, which can relieve back pain and decrease the need for pain medicines. Rest: Periods of adequate rest and elevating your feet will relieve the strain on your back. Pain medicine: Pain medicines, such as Tylenol, can relieve your pain but check with your doctor before taking any medicine during pregnancy. It is also important to avoid contributing factors, such as heavy lifting or bending, to prevent triggering or aggravating back pain. You have low back or coccyx pain and notice vaginal bleeding or you are leaking fluid. Burning, frequent urination or fever accompany low-mid back pain, suggesting a urinary tract infection. You have worsening numbness and tingling in your extremities, which could mean a significant nerve problem in your back, such as nerve entrapment. Back pain is common in pregnancy and is more likely to get worse during third trimester. However, you don't have to suffer as you have several remedies that can give you relief. Don't hesitate to consult your doctor for advice and treatment.